"Is the cooking pot calling the kettle black?" A former US Africa policy chief is accusing the Obama administration of not doing enough to advance American military, political and economic interests on the continent. The Bush administration’s senior Africa official went on to urge Obama “to translate the rhetoric of love” into hard-nosed policies. Frazer’s most provocative suggestion is to move the headquarters of the US Africa Command from Germany to Liberia. “The command needs to be in the region its operations are charged with shaping,” she argued, citing the Liberia’s offer to host Africom, but did not take note of other African governments’ opposition to a US military command on African soil. Frazer added that Africom should go beyond its current assessment of conditions in the eastern Democratic Republic of Congo and begin training DRC troops. 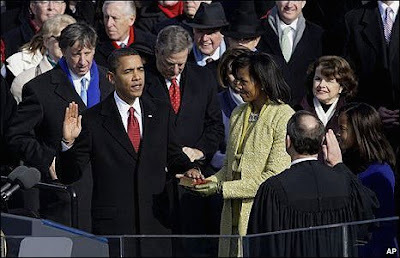 She further advised Obama to convene a White House summit of the leaders of Uganda, Rwanda and the DRC. “Obama needs to spend more time meeting and engaging African leaders to address the continent’s challenges,” Frazer wrote, adding that Bush had helped end interstate wars in the region by holding individual and trilateral meetings with the leaders of the three countries. Eritrea should be placed on the US list of state sponsors of terrorism, Frazer added, saying such a move would trigger sanctions against Eritrea as a way of helping prevent a reprise of the 1998 US embassy bombings in Nairobi and Dar es Salaam. She reasoned that since Al Qaida’s East Africa cell is based in Somalia and Eritrea is said to be aiding a Somali Islamist force linked to Al Qaida, US economic and political action against Eritrea will prove effective in combating terrorism in the Horn. The Obama administration should also oppose a Bill in the US Senate that would extend to some Asian countries trade preferences established under the African Growth and Opportunity Act. On National Public Radio, Frazer accused Obama of “talking the talk but not actually doing the work back home”, and him and his cabinet ministers of not seeking to squelch a move in Congress to give “hyper-competitive Cambodia and Bangladesh” the same advantages that Agoa offers to Africa. Legislation proposed by California Democratic Senator Dianne Feinstein would actually extend Agoa-type benefits to 15 countries in Asia, the Pacific and the Middle East. Giving only Bangladesh and Cambodia duty-free access to the US textile market would be sufficient to “wipe out Africa’s textile sector,” Frazer declared. Sen. Edward Kennedy's family fortune not only fueled his brothers' presidential campaigns and his eight terms in the U.S. Senate, it also helped drive the family's liberal legacy and forge Kennedy's lifelong crusade for universal health care. Untangling a family fortune that reaches back to the early days of the past century is murky business, but the annual federal financial disclosure reports Kennedy was required to file provide at least a' partial glimpse into his personal capital. Kennedy has other sources of income, including $1,995,833 in royalties he received from Grand Central Publishing a division of Hachette Group Book, publishers of his memoir True Compass scheduled for release in mid-September. Part of the proceeds will go to charity, including the John F. Kennedy Library. The main source of Kennedy's wealth was his father and family patriarch Joseph P. Kennedy who amassed a fortune in banking, real estate, liquor, films and Wall Street holdings that eventually grew to an estimated $500 million by the 1980s. The elder Kennedy helped transformed it into a national center for the home furnishings and design industries. The family retained ownership of the building until 1998 when it was sold — along with other properties including Chicago's Apparel Center which covers about a million square feet — to Vornado Realty Trust of Saddle Brook, N.J. for $625 million in 1998 to take advantage of the then-booming real estate market. "One of my cousins reminded me of a quote from my grandfather: 'Only a fool waits for top dollar,'" Christopher Kennedy, the son of the late Sen. Robert Kennedy told The Wall Street Journal at the time. "In the 1940s, my family bought the Merchandise Mart. In the 1970s, we bought the Apparel Center. And in the 1960 election, my family bought 20,000 votes," he said, referring to his father's narrow presidential victory. "Heartbroken parents pleaded with the doctors: What chance does my child have if I can only afford half of the prescribed treatments? Or two thirds? I've sold everything. I've mortgaged as much as possible," Kennedy wrote. "No parent should suffer that torment. Not in this country." WE HAVE THE HOPE. NOW WHERE IS THE AUDACITY? "Kennedy passed the liberal torch to Obama. Let's run with it!" 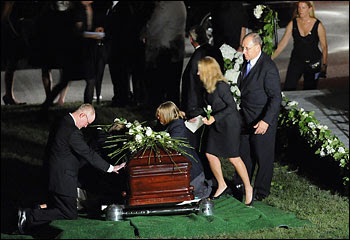 They buried Ted Kennedy on Saturday in an area of lush grass on the gentle slope beneath the mansion at Arlington National Cemetery. Brothers Bobby and Jack lie nearby. Here in this resting place for thousands of soldiers, astronauts, explorers and statesmen, the Kennedys have come together through triumph and tragedy in what amounts to a family plot, a piece of priceless real estate overlooking the nation's capital. The Kennedys occupy other turf as well -- sweeping terrain in the national psyche. The country has seen in the past three days the equivalent of a royal funeral. Saturday's funeral Mass in Boston was attended by four U.S. presidents. The description of the Kennedys as political royalty might as well be a federal regulation. Younger people might not understand why such a fuss has been made over a man who ran for president 30 years ago. It is hard to explain the Kennedy mystique to anyone who never experienced the tumult of the 1960s. In the visitors center at Arlington is a blown-up photo from Nov. 25, 1963 -- a bullet point in the history of American grief -- with Jacqueline Kennedy, face twisted in pain, having just received the folded flag that had covered her husband's casket. Next to her is Bobby, stooped in anguish. Teddy appears to be at the margin of the shot, back to the camera. Only a few years later, before he was ready, the youngest son became the only son left. 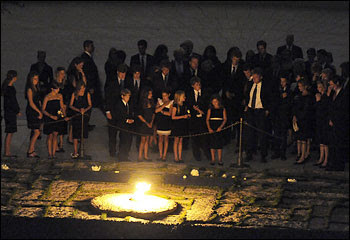 Edward Kennedy was, as President Obama said with great understatement at the funeral Mass, "heir to a weighty legacy." For the citizens of the country, Kennedy's death concludes a narrative more than half a century in the telling. It's a familiar story by now: Joseph Kennedy Sr. had four sons and dreamed that one would someday be the first Catholic in the White House. That ambition bent American history for decades to come. The saga was often dazzling, and persistently tragic. Now we know how the story ends. Quietly. Peacefully. The funeral Mass was somber and reverent, but it was preceded Friday night by a sometimes raucous, humorous celebration of the man's life. The last son died at home, among family, after sailing the Nantucket Sound almost to his final moments. A vivid era in American history is rapidly fading. The Culture Wars that began in the '60s came to define the ideological battles of the next three decades, with Kennedy an all-purpose symbol of the values of the left and Ronald Reagan playing a similar role for the right. The issues defined in that era no longer throw off as many sparks. Obama, who came to power with a boost from the senator, has vowed to leave the divisions of the 1960s behind. The baby boomers who pledged to bring about the Revolution now worry that health-care reform could undermine their Medicare. The space program is out of money. No one worries that Afghanistan will turn into another Vietnam; they worry it'll be another Iraq. The Beatles have become an interactive computer game. In Upstate New York, there was just a Woodstock anniversary -- the 40th -- but hardly anyone bothered to show up. Another page turned. Kennedy's death was surely, as every pundit and headline writer has noted in recent days, the end of an era. But the events of the past few days have reminded the country that the icon was also a man, never ordinary to be sure, but with joy and suffering like any other mortal. For the Kennedy family, the farewell was intensely personal and prayerful. The emotional pivot of Saturday's Mass came when Teddy Jr. delivered his eulogy. He spoke of trying, as a 12-year-old who'd just lost a leg to cancer, to climb a snow-covered hill so he could go sledding with his father. It was slick. He fell down. Cried. "I can't do this. I'll never be able to climb up that hill." His father picked him up in his arms and said: "I know you can do it. There is nothing that you can't do. We're going to climb that hill together, even if it takes us all day." As much as the Kennedy saga has been lived in public, we learned things Saturday. Had we known that Ted dressed as Santa at Christmas? That he was a Civil War battlefield buff? That he'd been recruited out of college by the Green Bay Packers, as Teddy Jr. informed us? "He was not perfect. Far from it. But my father believed in redemption," his namesake said. For the U.S. Senate, Kennedy's death means a dramatic drop in star power for a chamber that no longer is prowled by senators who cast a broad national profile and are brand names for their ideologies. The Senate today is largely populated by men and women who can walk the length of Pennsylvania Avenue without anyone doing a double take. Kennedy relished his outsized role. He jumped with both feet into any battle, never reluctant to punctuate a bellowed point with a loud thump of the lectern. Obama told a classic anecdote Saturday about the senator: "A few years ago, his father-in-law told him that he and Daniel Webster just might be the two greatest senators of all time. Without missing a beat, Teddy replied, 'What did Webster do?' "
For conservatives, Kennedy's death removes from the field a favorite boogeyman. During Republican primaries, all a candidate had to do to impugn an opponent's credentials was to insinuate some commonality with Ted Kennedy. Some of that enmity might eventually die out of its own accord, as there can be little satisfaction in raging against the departed. Even before now, the ritualized attacks on Kennedy had an obsolescent element -- bitter stuff boiled down after too long on the hot plate. The weight of the past grows lighter by the day. Go back to that Kennedy family plot, as it were, at Arlington: The quotes from President Kennedy, chiseled on a sweeping wall beneath the eternal flame, are those of a cold warrior, warning of the threats to freedom from a never-quite-defined enemy. The quotes from Robert F. Kennedy are chiseled on a more modest wall along a fountain. One is from the night that the senator went into the inner city in Indianapolis and told a largely black audience that the Rev. Martin Luther King Jr. had been assassinated. In a brave and moving speech, he said that his brother, like King, had been killed by a white man. Kennedy had quoted Aeschylus: "Even in our sleep, pain which cannot forget falls drop by drop upon the heart, until, in our own despair, against our will, comes wisdom through the awful grace of God." In the hot sun of Arlington on Saturday afternoon, Kay Wilson, 57, a teacher from Dumfries, recalled how her father taught her as a child all about the Kennedys. "We were almost obsessed," she said. She hopes the Kennedy mystique has not evaporated over the years. "I hope that feeling is still alive. That the mystique is still here. Because it was such an important part of my upbringing." Over at the Capitol, among thousands waiting for the Kennedy motorcade to pay a final visit to where the senator worked for 47 years, Barbara Keeling, 66, said what so many others have the past few days: "It seems like the end of something." "The politicians we grew up with." Teddy's sister Eunice died just two weeks earlier. There is now only one child surviving of Joe and Rose Kennedy's nine children -- Jean, looking fit and strong as she said goodbye Saturday to her brother. But then there are all those other Kennedys who filed into the church Saturday. Just as the Kennedys famously had a "compound" at Hyannis Port, they also have the ultimate clan, and for some time to come they will remain the first family of American politics. The youngest of them took turns, with great poise, at the lectern. It will shock no one if the names of some of those young Kennedys one day pop up on a ballot. They will tell stories about the Ted Kennedy they knew. The historians will chew on his record. And at Arlington, on that green hill with the exquisite view of the capital, the man's resting place will speak loudly for years to come. Visitors will know that these Kennedys really mattered to us. But as they pass into history, it will be harder and harder to remember just how much they charmed us, how much they inspired us and how much they broke our hearts. On the day he was carried to his final resting place, Sen. Edward M. Kennedy was remembered Saturday as a legislator of almost unequalled prowess, a political force who left a lasting imprint on the country and a husband, father and patriarch whose private acts of love and devotion helped his star-crossed family endure tragedy and misfortune. President Obama led the mourners at a solemn Roman Catholic Mass attended by 1,500 people, including three former presidents, at the Basilica of Our Lady of Perpetual Help in Boston, where the Kennedy family dynasty was born. A steady rain fell, adding an elegiac touch to a day already drenched in sorrow. After a last flight to Washington, the Massachusetts senator who served for 47 years was laid to rest in gathering darkness near his two slain brothers, John F. Kennedy and Robert F. Kennedy, on sloping ground at Arlington National Cemetery. Before the burial ceremony, the hearse carrying Kennedy stopped at the plaza on the East Front of the Capitol. There former Kennedy staffers, lawmakers, other congressional aides and members of the public were gathered to pay their respects. As the crowd broke into applause, Kennedy's widow, Vicki, emerged, offering embraces. After a short prayer service and the singing of "America the Beautiful," the motorcade proceeded along Constitution Avenue to the cemetery. Kennedy (D-Mass.) died Tuesday night after being diagnosed with brain cancer more than a year ago. His death produced an outpouring of emotion and tributes from around the world that was captured eloquently on Saturday. "We do not weep for him today because of the prestige attached to his name or his office," Obama told the friends, dignitaries and Kennedy family members seated in the majestic basilica in Boston. "We weep because we loved this kind and tender hero who persevered through pain and tragedy, not for the sake of ambition or vanity, not for wealth or power, but only for the people and the country he loved." The president's remarks were largely shorn of political overtones, as he concentrated on the example Kennedy set for fellow politicians and ordinary citizens alike through his public and private works. "The greatest expectations were placed upon Ted Kennedy's shoulders because of who he was, but he surpassed them all because of who he became," he said. Obama spoke of Kennedy's resilience in the face of "events that would have broken a lesser man," recalling that he was the youngest of nine children but became a rock to his family. Summoning the spirit he attributed to Kennedy in times of difficulty, Obama said, "We carry on." Obama's closest reference to the contemporary political climate as Washington prepares for a fall struggle over health care came when he said of Kennedy: "He was the product of an age when the joy and nobility of politics prevented differences of party and philosophy from becoming barriers to cooperation and mutual respect -- a time when adversaries still saw each other as patriots." Before Obama's eulogy, Edward M. Kennedy Jr. and Patrick J. Kennedy offered poignant memories of their father that brought both tears and laughter from the audience. Ted Kennedy Jr., who lost a leg to cancer when he was 12, recalled his father's strength and inspiration as he struggled with his physical handicap. His voice choked with emotion, he remembered a sledding expedition on a snowy day not long after his leg was amputated. After he had fallen, his father helped him climb an icy hill when he doubted his own physical capacity to do so. "We're going to climb that hill together, even if it takes us all day," the younger Kennedy said his father told him. He added: "You see, my father taught me that even our most profound losses are survivable, and that it is what we do with that loss, our ability to transform it into a positive event, that is one of my father's greatest lessons." Ted Kennedy Jr., 47, a lawyer and investment banker who lives in Connecticut, quickly turned the congregation's tears to laughter when he recalled his father's adventuresome spirit and his determination that his children share it. "Our family vacations left us all injured and exhausted," he said. Patrick Kennedy, 42, an eight-term House member from Rhode Island, remembered how his father would sit by his bedside, applying a cold, wet towel to his forehead to provide relief from the pain of headaches induced by asthma medication. "He remained to me a magical figure," he said. Earlier, the Rev. Mark R. Hession, who was friend and family priest to Edward and Vicki Kennedy on Cape Cod, delivered the homily. He connected the senator's commitment to social justice and the needs of the poor to Kennedy's experience as part of "a vibrant and caring family" whose narrative "is woven throughout the history of the nation for the past half-century." Hession noted that the choice of Our Lady of Perpetual Help for Kennedy's funeral Mass reflected the intersection between the senator's public and private lives. Kennedy came to the church regularly to pray for the recovery of his daughter Kara as she fought her own battle against cancer several years ago. But its location, in a neighborhood where immigrants and minorities struggle to provide their families a better life, symbolized the work of Kennedy's political life. The day's formal ceremonies began at the John F. Kennedy Presidential Library and Museum, where the senator's body had lain in repose on Thursday and Friday, viewed by an estimated 50,000 people. The library was the site Friday of an exuberant three-hour service of music, storytelling, tears and laughter. 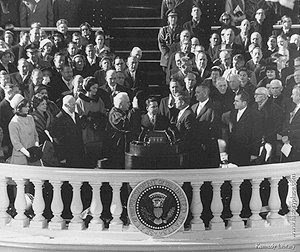 Kennedy's colleagues, friends and family members shared personal memories of a larger-than-life figure who overcame personal failings, turned his life around and ended up with a reputation as one of the finest legislators in the nation's history. Saturday morning, Obama paid a short private visit to Vicki Kennedy. He walked across the street from his hotel to offer condolences to the widow of the man whose endorsement provided a critical boost to his candidacy during the 2008 Democratic nomination battle against Hillary Rodham Clinton. At the library, Vicki Kennedy greeted a delegation of senators and House members. Throughout the day, she was praised as her husband's friend and partner, whose love and devotion helped Kennedy turn his life around and make his final years some of his best. When it was time to leave the library, Kennedy's flag-draped casket was covered with plastic to protect against the rain. It was carried by a military honor guard walking in deliberate steps to a hearse for the drive to the basilica. Inside the church, a remarkable collection of people gathered. They included former president Bill Clinton and Hillary ; former president George W. Bush and his wife Laura; former president Jimmy Carter and his wife Rosalynn; and Vice President Biden and his wife Jill. Obama and his wife, Michelle, sat in the front row with the Bidens; the former presidents and their wives were a row behind them. Obama and Bill Clinton, tense adversaries during the Democratic primaries, chatted amiably as they waited for the service to begin.Other mourners included former vice president Al Gore, House Speaker Nancy Pelosi (D-Calif.), Senate Majority Leader Harry M. Reid (D-Nev.) and Supreme Court Justice Stephen G. Breyer, a former Kennedy aide. Two Republican friends of Kennedy's, Sens. John McCain of Arizona and Orrin G. Hatch of Utah, sat side by side. They had spoken of their friendship with Kennedy at Friday's memorial. Outside on the steps, huddled under large black umbrellas, stood the honorary pallbearers. They included Sen. John F. Kerry (D-Mass. ), who, like Obama, owed his nomination for president in part to Kennedy's endorsement. 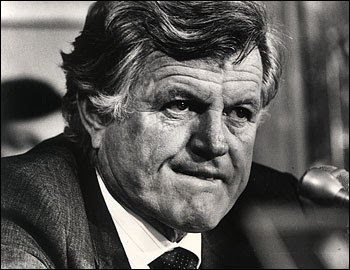 Kerry had become devoted to Kennedy over the years. Bells began to toll at 10:45 a.m. as the motorcade arrived and, a few minutes later, Kennedy's casket was taken from the hearse. Vicki Kennedy and other family members stood vigil, water rolling off their umbrellas, as the casket was carried up the steep steps into the church. The procession included priests wearing white vestments and Cardinal Sean O'Malley, the archbishop of Boston, distinctive in scarlet. The responsorial psalm, Psalm 72, was read by Kara Kennedy, and it offered testimony to Kennedy's lifelong commitment to the poor and dispossessed: "For he shall rescue the poor man when he cries out and the afflicted when he has no one to help him. He shall have pity for the lowly and the poor; the lives of the poor he shall save." The Mass included music from cellist Yo-Yo Ma, tenor Placido Domingo, the Tanglewood Festival Chorus and mezzo-soprano Susan Graham, who gave a haunting rendition of "Ave Maria." The rain turned hard as the service ended and the carefully choreographed ceremonies fell significantly behind schedule. Kennedy's body, accompanied by family members and others, was taken to Hanscom Air Force Base for the flight to Andrews Air Force Base. By the time the funeral procession reached Arlington National Cemetery, the sun had set and the gravesite was shrouded in darkness. It sits 100 feet away from Robert F. Kennedy's in an arc that includes the gravesite and eternal flame for John F. Kennedy. Cardinal Theodore E. McCarrick, a friend of Kennedy's, presided and read from a letter the senator had written to Pope Benedict XVI, which Obama had delivered to the pontiff in Rome. In the letter, Kennedy wrote he had been "an imperfect human being but with the help of my faith I have tried to right my path." His grandchildren spoke lovingly of their relationship with him and a military rifle squad fired off three volleys. In his prayer, McCarrick asked God to bring Kennedy "to everlasting peace and rest." Richburg reported from Boston. Staff writer Michael D. Shear contributed to this report. WTO DOHA NEGOTIATIONS: DO DEVELOPED COUNTRIES WANT TO HAVE THEIR CAKE AND EAT IT? Since the last World Trade Organisation (WTO) Ministerial meeting took place in Hong Kong in 2005, the WTO Doha negotiations have remained at an impasse. Attempts to revive negotiations last year during the July 2008 mini Ministerial meeting failed. In principle what the Doha Declaration agreed to in 2001 was meant to foster ‘development’ in developing countries and address the adverse impact of trade liberalization and deregulation. Since then, Doha negotiations have been dragging on for almost a decade with developing nations rightly remaining cautious about concluding a ‘bad deal’. Negotiations continue to be unbalanced with developing countries still being offered a raw deal. The stalemate is largely over developed countries’ reluctance to make considerable reductions in their trade distorting agricultural subsidies and unbalanced proposals for further reductions in industrial tariffs. Developed countries are only prepared to make meagre concessions to reduce their trade distorting subsidies. However, developing countries are being asked to make trade-offs to gain market access for their agricultural goods in exchange for opening up access to their industrial and service sectors. In a sense developed countries want to "have their cake and eat it." “An outcome that differentially hurts developing countries or benefits developed countries more should be seen as failing the Doha development promise of enhanced market access for developing countries,” argues Rashid S. Kaubab, author of the book Benchmarking Development for Hong Kong and Beyond: Strengthening Africa in World Trade. From 30 November to 2 December 2009, after a spate of failed attempts to revive the WTO Doha Negotiations, a WTO Ministerial conference will take place in Geneva. It's a much-anticipated event given American President Barack Obama’s enthusiastic endorsement of the G20 statement in April this year, calling for a conclusion of the Doha talks. To create new impetus for the WTO Doha negotiations, a mini Ministerial meeting is planned to take place from 3-4 September 2009 in Delhi, India. According to sources, the meeting is not meant to have real negotiations and will simply be a general meeting where statements are made. South Africa is one of 36 countries invited to the meeting either as coordinators or representatives of various WTO groups. Zimbabwe, Tanzania, Nigeria and Burkina Faso constitute the balance of invited African countries. Pascal Lamy, the WTO Director General, has been meeting various governments to encourage the conclusion of these negotiations. He is confidant that all the recent discussions point towards the conclusion of the Doha Round in 2010. Lamy recently visited South Africa, which is in a very precarious situation with regard to further industrial tariff cuts. In the WTO, South Africa is classified as a developed country and further tariff cuts under the proposed WTO formula will not only have implications for our industrial sector and further job losses, but also affect the Southern African Customs Union (SACU), which consists of small and vulnerable economies. Lamy's key message is concern about signs of protectionism during this global economic crisis. In a recent report to the WTO Trade Negotiations committee at a meeting of ministers and heads of states and governments, he stressed: "(i) We need to keep trade open and resist protectionist measures. (ii) The best way to keep trade open is to keep opening trade, hence the need to conclude the Doha Round as soon as possible." The alarming aspect about urgency to conclude the Doha round is the lack of recognition that the very rules and policies espoused by the WTO are at the core of the global economic and planetary ecological crisis, i.e. to prioritise growth based on standard economic models. This entails integration into the global economy based on neo-liberal policies that enforce global privatisation, deregulation, trade liberalization and the opening of financial markets and institutions with the aim of preventing regulated capital flows and generally promoting more market driven economies that continue to have a devastating impact on jobs, poor peoples quality of life and the planet's resources. Developing countries are faced with a number of challenges to meet their development needs. These include growing their economies, addressing high levels of poverty, ensuring job creation, expanding their manufacturing bases and managing their resources. The question is, in the context of the global economic and planetary crisis, will the WTO negotiations seek the opportunity to question unbalanced trade rules or continue negotiations within the current economic paradigm that essentially perpetuates underdevelopment in developing countries? The current state of play amongst the WTO members - more so from developing countries - is that unless agreement is reached on agriculture and non-agricultural market access (NAMA), no negotiations will take place on other issues such as services, trade in environmental goods/services, trade facilitation and geographical indicators, amongst other issues. The stalemate in the negotiations questions the legitimacy of the WTO to promote fair and balanced multilateral trades rules that will addresses the past and current inequities, which developing countries are faced with. On agriculture, points of contestation are the elimination and/or reduction of trade distorting subsidies and substantial market access opportunities for developing countries’ agricultural goods. Developing countries that belong to the G20 and also happen to be big industrial agricultural producers have formed a coalition. These countries have a proactive interest in greater market access in the developed world. South Africa is part of the G20, but South Africa, like many industrialized developing nations has huge inequities in the productive capacity of agricultural goods. Countries like South Africa have to address land access and redistribution as well as provide productive support for small-scale and subsistence farmers before throwing their lot in with the globalised industrial agricultural sector. Within the WTO's Group of 33 (G33) countries, there are also countries that have huge peasant, family, subsistence and small-scale farming communities. Vitally, these countries are calling for special safeguard measures to protect their small-scale and emerging farmers from the adverse effects of trade liberalization. India, for example, belongs to both the G33 and G20. So while the G20 is calling for greater market access, it will mostly benefit large-scale agriculture farmers and businesses, if at all. Furthermore, the WTO perpetuates the current permissive industrial agricultural production and trade system in genetically modified organisms and agrofuels (biofuels) that contribute significantly to climate change. On NAMA, developing countries want guaranteed policy space. In other words, the right to develop policy through experimentation, in addition to the flexibility to design industrial, trade, technology and social policies unique to their respective situations. The challenge for developing countries is how they use the policy space if they get it. Certain economic instruments are necessary, such as the flexibility to raise or drop industrial tariffs when necessary, particularly to protect industries and jobs from import surges as well as to allow subsidies to support infant industries and build domestic capacities and assets. The current WTO negotiations curtail these instruments and subject countries to binding commitments. At the same time, past and current industrial development is having a significant impact on the physical environment, the use of natural resources and the socio-economic rights of workers. At the same time, developed countries' demands are accommodated to protect their sensitive sectors. In the December 2008 WTO NAMA text an "anti-concentration" clause, proposed by developed countries, was included. Martin Khor former Director of Third World Network explains that the clause "is designed to prevent developing countries from excluding an entire sector, or close to an entire sector from full formula tariff cuts." Current trade policies and agreements do not serve people's development rights and needs as well as national development aims -- especially the goals of poverty eradication, job creation and socio-economic and environmental justice. Such instruments and policies should not just be questioned, but challenged. THE APRM AT CROSSROADS: CAN ADEDEJI DELIVER AN OBJECTIVE ETHIOPIAN REPORT? The African Peer Review Mechanism is facing a litmus test. The grapevine among the donor community across the continent is something to worry about. Apparently they have consulted widely and come to a consensus that the once lauded African success story may be gradually facing its demise. “There are currently no champions and as long as there are no sincere champions; the likes of Meles will use it to their own advantage. Although grassroots are excited, the top leadership does not care about it. Meanwhile corrupt bureaucrats at the Secretariat, will always grow fat on ignorant "leaders" and donor largesse. This is exactly what is happening. Ross Herbert, a South African researcher has always posed this question: "who is policing whom within the APRM set up?" “There does not seem to be a great deal of interest in the subject continentally. Donors, who might ask pointed questions, seem concerned not to look pushy, although in my conversations with them, I think they show that they have drawn fairly negative conclusions about what the fates of Nepad and APRM say about commitment to reform. “With Mbeki and Obasanjo gone, there are no powerful patrons to ask questions about APRM. Within SA there is a unit within the department of foreign affairs that would like to see APRM strengthened but they strictly avoid the implications of how SA conducted its APRM and don’t engage with how or if it is following through on its APRM commitments. “Here the APRM review touched on all the key issues but no one wants to take forward reforms under an APRM umbrella. Each issue, whether company law, human rights, aids or crime, has its own players and dynamics. It is not that APRM was ineffective; just that it is a relatively small thing in the national consciousness and has no real power to accelerate reforms in any of those areas. Several worrying developments point to this direction. First, since one Dr. Bernard Kouassi left the secretariat almost two years ago, no substantive replacement has been recruited despite the fact that the post was advertised long before his departure. Second, the number of eminent persons has been dwindling with time with no immediate replacement such that today, the only active and available persons are Professor Adedeji who also doubles as the chairman. He got his term renewed under questionable circumstances. Some pundits allude his unprecedented second term as chairman of the Panel of Eminent Persons to his closeness with Melles Zenawi during his years at the ECA in Addis Ababa. The other members are Dr. Graca Machel of Mozambique and a new comer, Mrs. Domitila Mutantaganzwa from Rwanda who is believed to be Bethuel Kiplagat’s replacement. There is also Prof. Mohammad Barbes, from Algeria, who owes his re-nomination to the panel from his country’s President, Abdoulaziz Boutefleka, one of the founding fathers of NEPAD. As it is now, the panel is three members short of the initial seven members appointed by HSIC in 2003. To complicate matters, there is no word on when and how the vacancies on the panel will be filled. Adedeji is said to have circulated a document during the last NEPAD Steering Committee meeting in Sirte, Libya, which proposes a full panel of nine members with only five of them nominated by each of the sub-regional groupings of the AU while the other four are head-hunted, presumably by Adedeji himself. As an inter-governmental body, the notion of head hunting close to 50% of panel members runs contrary to all principles of collective self-monitoring that underlie the APRM process. However, the biggest challenge facing the APRM is the apparent lack of direction from the APRM Forum as used to be under Olusegun Obasanjo. It is what seems to be compounding its problems. For this reason many qualified and experienced officers have either left for greener pastures or have been forced out by Prof Adedeji who is more comfortable dealing with cronies at the Secretariat than harnessing the expertise he found there. The crux of the matter is, soon after Kouassi left as the Executive Director of the Secretariat, Adedeji who was the serving chairman of eminent persons quickly assumed the ED position even though the panel had appointed an Ethiopian due to his seniority status to act in the interim. It may be remembered that a few months ago, Prof Adedeji decided to reorganize the entire secretariat. He hired a consultant who together with him came up with a new organogram that also created several new posts with the APRM. Following this new reorganization, Adedeji terminated the contracts of all existing staff and went ahead to advertise the jobs in some West African publications published in London. He also posted the same ad on the APRM website. It is still not clear whether the AU Structures Committee of the Permanent Representative Council (PRC) made of African Ambassadors accredited to the AU have even deliberated or approved Adedeji’s organogram. Neither has the AU Chairperson, Jean Pean, who is expected to oversee the new APRM structure directly, approved it. According to close sources, he is either too busy or is disinterested and afraid to offend his host-government of Ethiopia. The only two individuals who apparently have given their blessings to this new structure are Adedeji and his boss, Prime Minister Meles. However, information coming from the Secretariat indicates that when other eminent persons got wind of what was going on, the recruitment drive was put on hold pending further consultations. What is not clear is the fate of the old employees whose contracts will be terminated at the end of September by Adedeji. As these problems continue to dog the secretariat, the Ethiopian review is going full steam. What makes the Ethiopian review a test case is that for the first time in the history of the APRM, a country whose leader is the chairman of the APRM will be reviewed by the chairman of the Panel of Eminent Persons appointed by the same leader. Obasanjo, who also served as Chairman of the APRM Forum never had his country reviewed before leaving office and kept stalling the review apparently due to his third-term bid in 2007. In a strange move early this year, Melles Zenawi renewed Adedeji’s chairmanship after it expired.. Now Adedeji has allocated himself the role of team leader for the Ethiopian country review by removing then Panel Member Ambassador Kiplagat, who was originally assigned Ethiopia. If this is not conflict of interest then we may never know what is. Whether we like it or not, Adedeji owes Melles Zenawi big. Technically Zenawi is his immediate boss and supervisor. Since 2005, Meles has been under the international donor community watch list following human rights abuses during that year’s elections. Many Ethiopian watchers believe that he needs Adedeji to give him a passing grade as he goes into an election next April. When the report is tabled, Adedeji will find it a challenge to present an honest and credible report about his boss to the African Heads of State and Government whose chair will be the same Zenawi. Both Adedeji and Zenawi will find it very difficult to be detached from the report while forum members, if they are sharp shooters like Abdulahi Wade or Paul Kagame, may have problems believing the authenticity of the Ethiopian report. This is why if Zenawi and Adedeji are truly interested in preserving the credibility of the APRM, another eminent person such as Graca Machel should be appointed to lead the review team in Ethiopia because as of now, Adedeji at age 80 who recently suffered a mild stroke is physically unfit to endure an assessment schedule in the rough terrain of a huge country like Ethiopia while in a wheelchair. It is not too late to salvage the situation. A few weeks ago, the newly constituted Kenya APRM Governing Council had a retreat at the Kenyan coast to chat the way forward. This came soon after the planned visit by Graca Machel to launch the second round of the Kenya review was abruptly postponed indefinitely by the government of Kenya. It is true Kenya is due for review after it successfully completed the first round in June 2006 in Banjul the Gambia. However, another Kenyan review at this point in time may be ill-advised and serve no useful purpose. Not because of the resources needed but rather the relevance and necessity of the exercise at this point in time. The reasons for this are many and varied. Top among them are the overarching issues that Graca Machel raised in Banjul in June 2006. She listed rampant corruption, ethnicity, landlessness, a failed judicial system, political violence, poverty, inequality, Youth joblessness, insecurity, police brutality, extrajudicial killings, press freedom and credible electoral system among others as issued that the Kenya government needed to address urgently to avoid social unrest. Kenyan observers believe that had Kibaki heeded the APRM warnings in Banjul and took genuine steps to reform the Judiciary and the Electoral Commission of Kenya; Kenyans would not have gone to war in 2007. Had the sensitive land issue in Rift Valley been addressed soon after Banjul, the Kalenjins would not have taken their bows and arrows to drive away “foreigners” from the midst. During the 2007 elections, corruption put democracy on sale. The most moneyed, the most corrupt and the most violent of the warlords carried the day. Everything and everybody was up for sale from the election commissioners to the priests, journalists, civil servants, the police, the justice department and returning officers in the field. Because of this mess, Chairman Kivuitu lost control to his juniors. Politicians became warlords and dictated who to elect to parliament. Elections were rigged by all political parties right from the nomination stage. The most violent politicians were nominated by their parties. All these problems could have been avoided had we reformed the ECK and the Judiciary. Because we have not put our house in order, it may be pointless and a waste of time and resources to embark on another futile exercise. However, a more plausible reason against the second review is the fact that since the beginning of 2008, Kenya has conducted the Kriegler and Waki Commissions whose reports are currently under implementation. These two commissions dealt at length and in detail with our electoral challenges and impunity in Kenyan politics that has become our way of life. As I write this article, there is a bill in Parliament trying to establish a local tribunal to try perpetrators of the 2007 post election violence that left 1500 Kenyans dead. The political arena is too charged to allow for another APRM. The other mitigating factor against a Kenyan review is that at the moment the Kenya Truth, Justice and Reconciliation Commission has just been launched. This commission will interrogate past injustices and crimes that have taken place in Kenya since 1963. Central to this commission will be land problems, political murders, inequality and ethnicity, powers of the president, corruption in public service, a failed judiciary, police brutality, state terrorism and the rot in our political system. It will be so comprehensive that to conduct another parallel public dialogue will be to duplicate efforts. This Commission is led by Bethuel Kiplagat, the immediate former Panel member of the APRM. The comprehensive Kenya Constitution Review is currently putting the final touches in its draft report. If all goes well, Kenyans may vote for a new constitution in a referendum next year. Common sense would therefore inform someone that this is not the time to conduct a second APRM in Kenya even if the AU timetable says it is due. As I write this article, Kenya has just launched two important strategic plans; Vision 2030 and the Prime Minister’s Strategic Plan. Both plans are under the Prime Minister ‘s office where the Planning Ministry is based. Incidentally the Planning Minister is also the man in charge of APRM in Kenya and as things stand, it will be a miracle if he pays attention to another review because it definitely will not be his priority. Under the circumstances, the APRM Continental Secretariat may find it sensible to focus on countries like Angola, Egypt Malawi, Tanzania, Sudan and Zambia that are yet to go through the first round as Kenya puts its house in order.